During the British Raj, portions of the western coast of India under direct British rule were part of the Bombay Presidency. In 1937, the Bombay Presidency became a province of British India. As a result of the States Reorganisation Act on 1 November 1956, the Kannada-speaking districts of Belgaum (except Chandgad taluk), Bijapur, Dharwar, and North Canara were transferred from Bombay State to Mysore State. but the State of Bombay was significantly enlarged, expanding eastward to incorporate the Marathi-speaking Marathwada region of Hyderabad State, the Marathi-speaking Vidarbha region of southern Madhya Pradesh, and Gujarati-speaking Saurashtra and Kutch states. The Bombay state was being referred to by the local inhabitants as "Maha Dwibhashi Rajya", meaning, "the great bilingual state". In 1956, the States Reorganisation Committee, against the will of Jawaharlal Nehru, recommended a bilingual state for Maharashtra-Gujarat with Bombay as its capital, whereas in Lok Sabha discussions in 1955, the Congress party demanded that the city be constituted as an autonomous city-state. In the 1957 elections, the Samyukta Maharashtra movement opposed these proposals, and insisted that Bombay be declared the capital of Maharashtra. 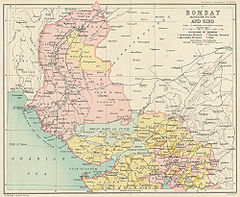 Bombay State was finally dissolved with the formation of Maharashtra and Gujarat states on 1 May 1960. Following protests of Samyukta Maharashtra Movement, in which 105 people were killed by police, Bombay State was reorganised on linguistic lines. Gujarati-speaking areas of Bombay State were partitioned into the state of Gujarat following Mahagujarat Movement. 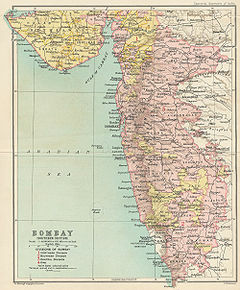 Maharashtra State with Bombay as its capital was formed with the merger of Marathi-speaking areas of Bombay State, eight districts from Central Provinces and Berar, five districts from Hyderabad State, and numerous princely states enclosed between them. In 1960, the designation of the "Governor of Bombay" was transmuted as the Governor of Maharashtra. Mahagujarat Movement for separate Gujarati state. ^ Yagnik, Achyut; Suchitra Sheth (2005). The Shaping of Modern Gujarat: Plurality, Hindutva, and Beyond. Penguin Books India. p. 226. ISBN 978-0-14-400038-8. Retrieved 24 November 2012. ^ a b Grover, Verinder; Ranjana Arora (1994). Federation of India and States' Reorganisation: Reconstruction and Consolidation. Deep and Deep Publications. p. 392. ISBN 978-81-7100-541-3. Retrieved 24 November 2012. ^ "States Reorganization Act 1956". Commonwealth Legal Information Institute. Archived from the original on 16 May 2008. Retrieved 1 July 2008. ^ "The battle for Bombay". The Hindu. 13 April 2003. Archived from the original on 3 April 2010. Retrieved 12 November 2008. ^ "Samyukta Maharashtra". Government of Maharashtra. Archived from the original on 6 October 2008. Retrieved 12 November 2008. ^ Sadasivan, S. N. (2005). Political and administrative integration of princely states. Mittal. ISBN 9788170999683. ^ "Sons of soil: born, reborn". Indian Express Newspapers (Mumbai) Ltd. 6 February 2008. Retrieved on 12 November 2008. ^ "Gujarat". Government of India. Retrieved 16 January 2008. ^ "Maharashtra". Government of India. Retrieved 16 January 2008. ^ a b "Previous Governors List". Raj Bhavan (Maharashtra). Archived from the original on 6 February 2009. Retrieved 23 December 2008.